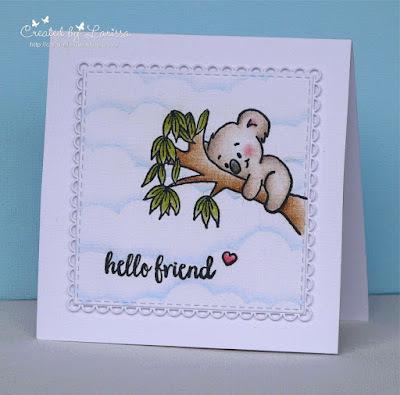 Todays project is another card I created as a guest designer for Gerda Steiner Designs. 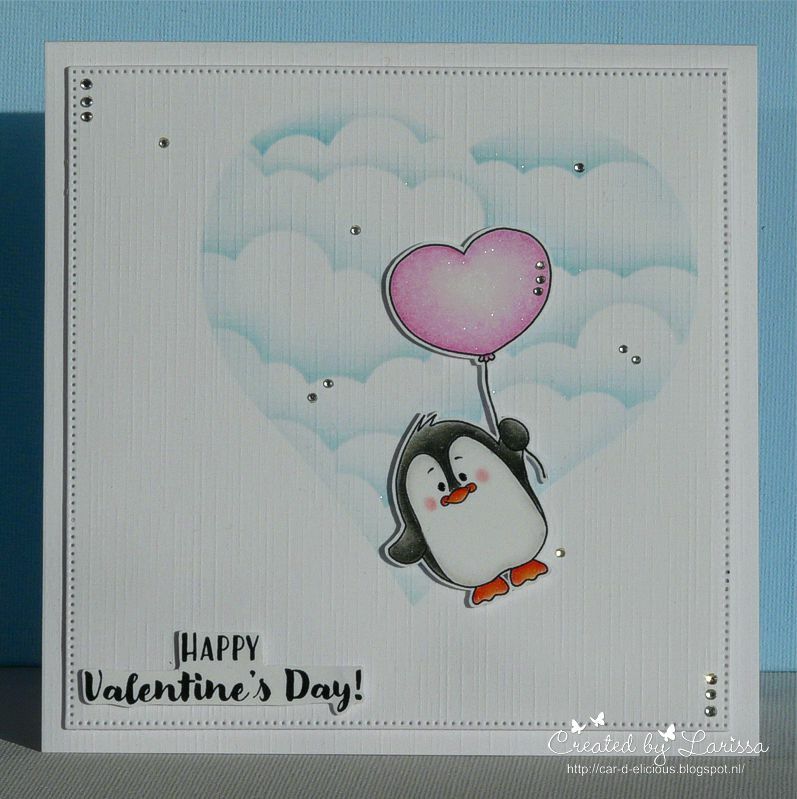 My idea for this one was penguins on the tundra with happy greetings and the penguin holding the balloon fit in perfectly. 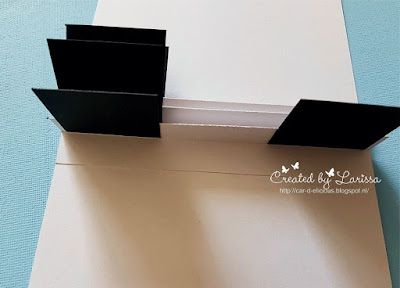 The bottom snow panel can be created two ways. 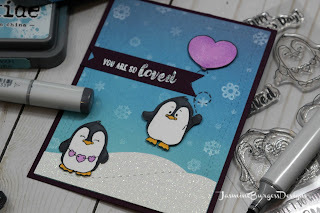 The first is by using white glitter cardstock cut to size freehand or with a die, which is what I did. 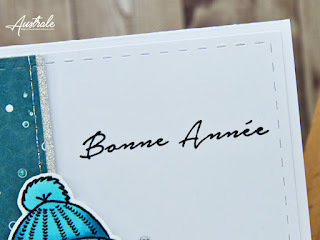 The second is to cover piece of white cardstock with Versamark and heat emboss using white glitter embossing powder. If you're not into glitter, you could just use white cardstock. 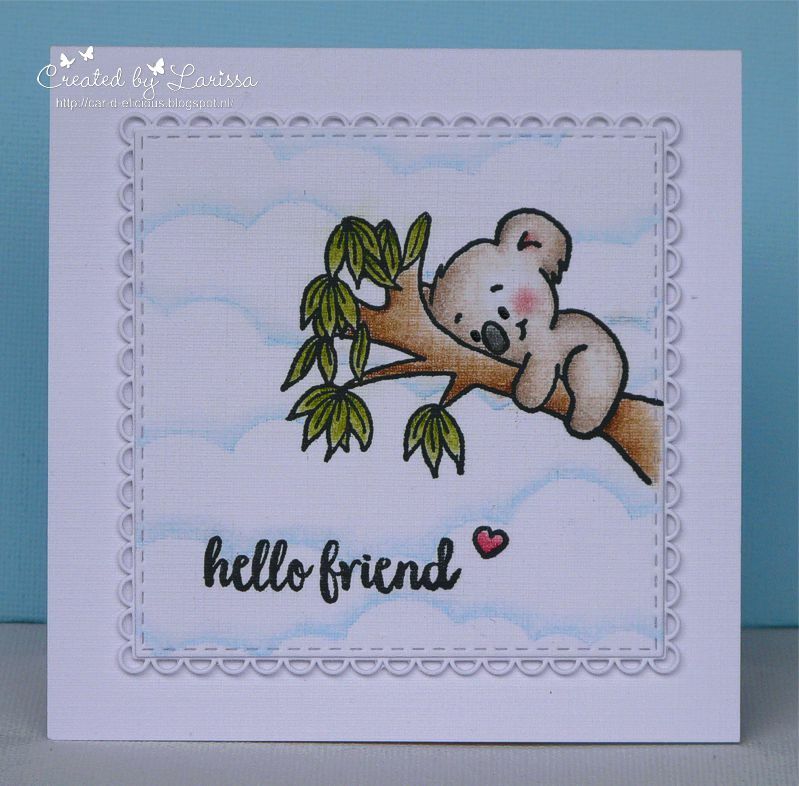 The background was made with 3 shades of blue Distress Oxide inks. If you aren't familiar with them, they are a hybrid of dye and pigment inks, giving them super easy blending and there are several fun techniques you can do with them (but that's another post). The penguins were stamped in Memento Tuxedo Black ink and colored with Copic markers, then fussy cut. 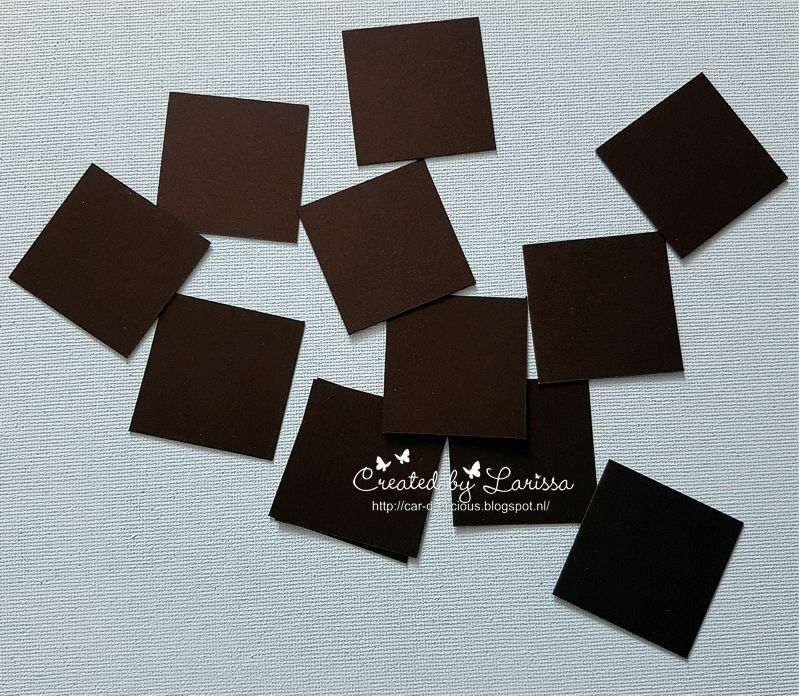 I don't have the dies yet and these are fairly simple shapes to cut out. The penguin with the balloon is one image, but I just cut them apart to avoid trying to cut out the string. 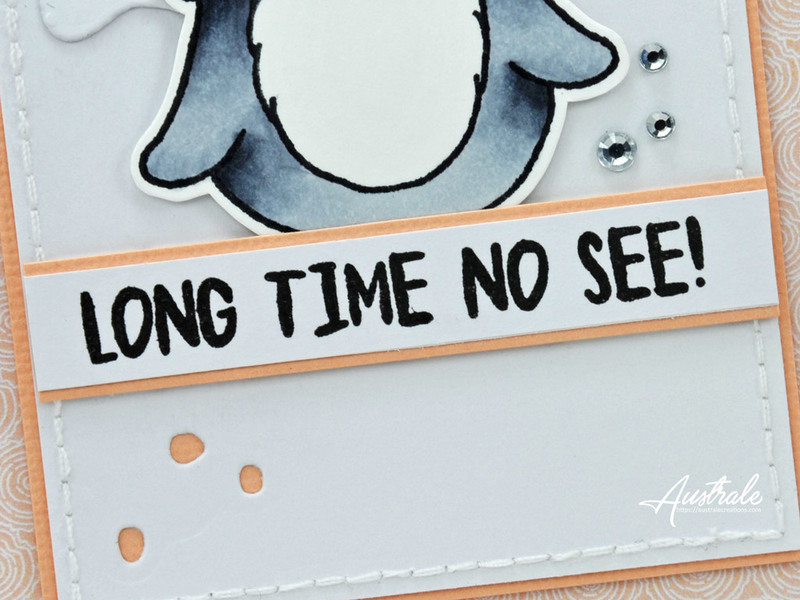 Instead, I fussy cut the balloon and penguin and stamped a swirly dash line from another stamp set in my stash for the balloon string. That allowed me to have more flexibility with placing the penguin and balloon as well as the ability to add dimension by popping them up with foam squares. 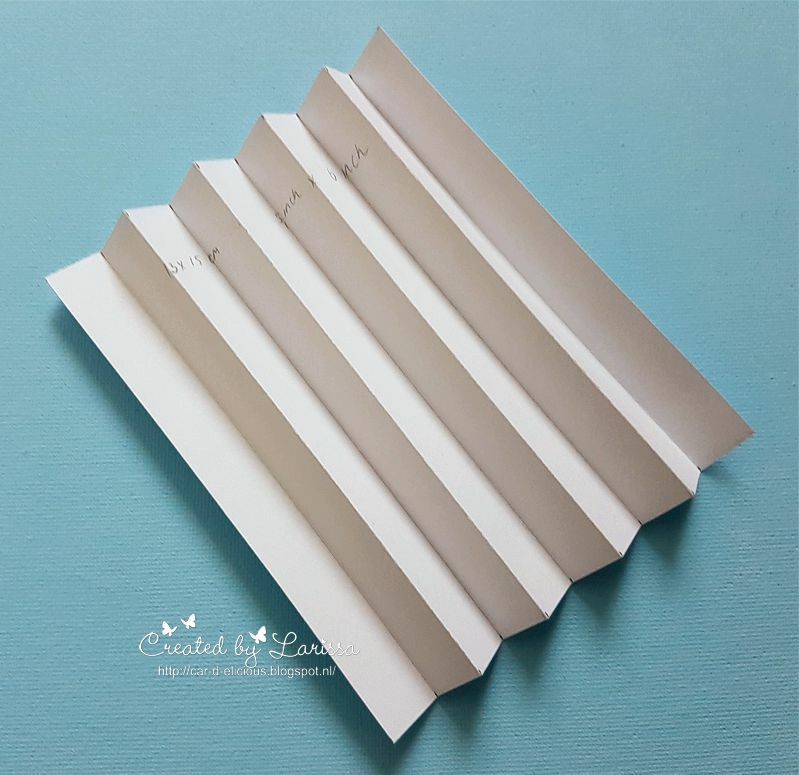 I have a video tutorial on my YouTube channel if you'd like to see how this project came together from start to finish and my supplies are listed and linked below. Thank you to Gerda Steiner Designs for having me! I look forward to doing it again sometime. Always happy to help with questions if you have any and please let me know how you like todays card. See you next time! 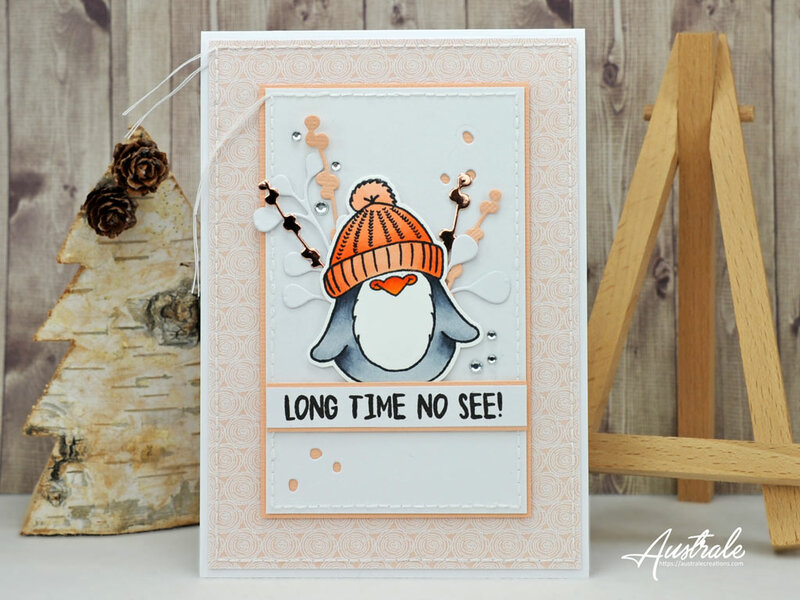 It's Céline from Australe Créations, I'm back for another card, so happy to find you ! Thanks so much for stopping by today, I hope you like it ! This time I made a card with a cute image from the stampset Valentine penguins from Gerda Steiner designs. 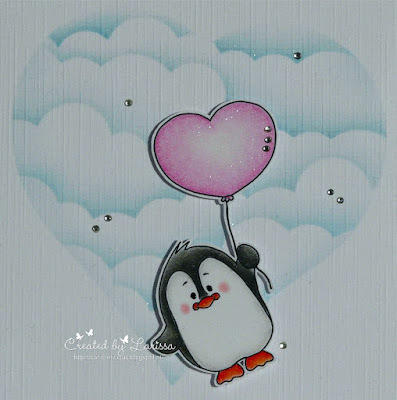 I have used the image of the penguin with the heart balloon. 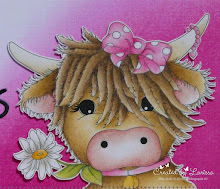 I coloured the image with my Polychromos pencils and the black glaze pen. 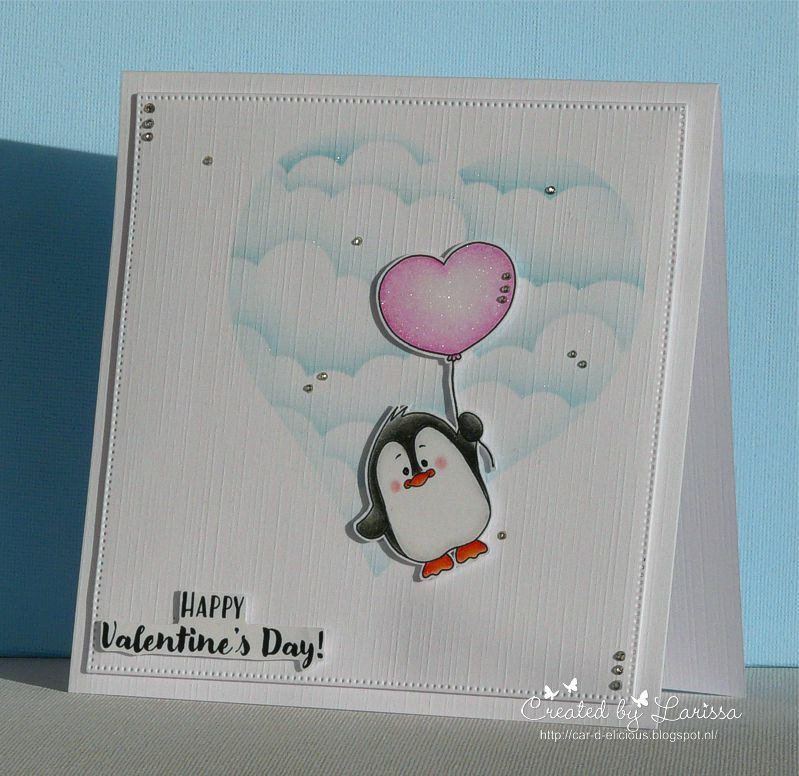 The balloon is coloured with the Clear Spectrum noir sparkle pen. I have fussy cut the image. From white cardstock I have cut a square with the Crea-nest-lies XXL 42 from Crealies. With a heart die I have cut a heart from a piece of masking paper. 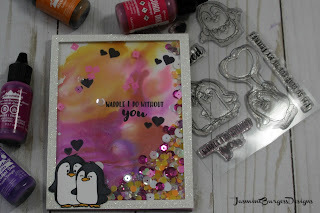 I put the left over piece of the masking paper on the sqaure and then I made a cloudy background with the Mini cloud edges stencil from My favorite things and Tumbled glass distress ink. 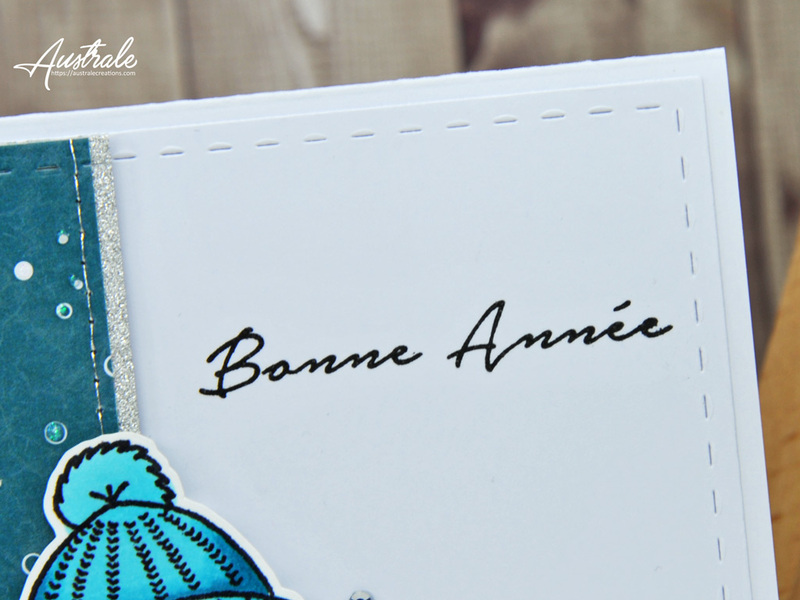 After I adhered the square on a white card I adhered the image and the sentiment with foamtape on the card. 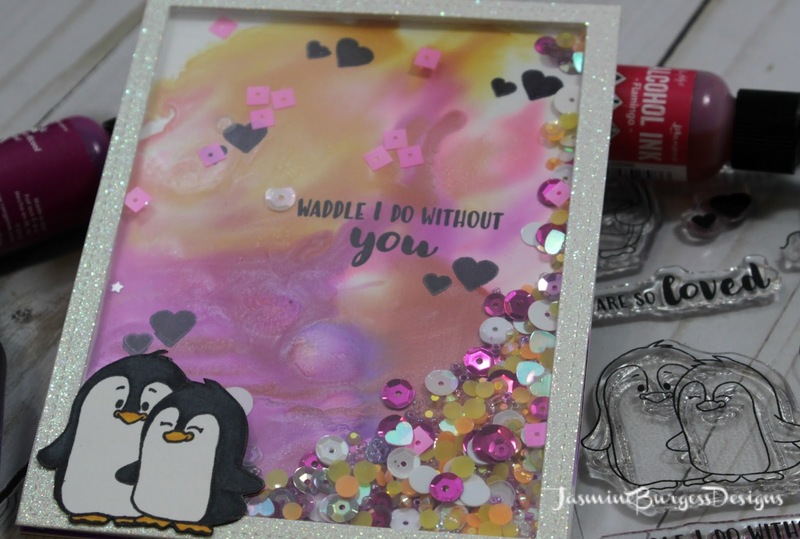 I decorated the card with crystal hotfix gems. 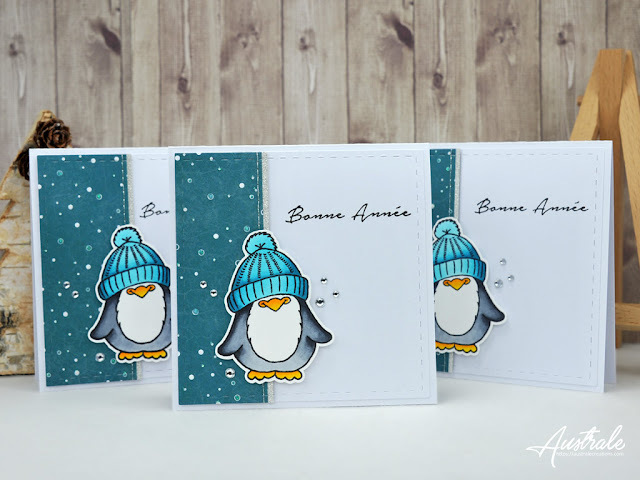 Hazel from Didos Designs here. Happy New Week!!! Boy can you beleive that January is more than half way past!!! Time flies when you're having fun. 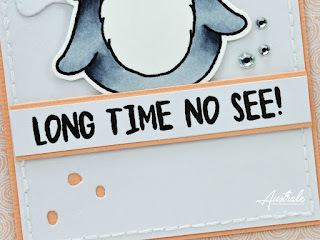 Talking of fun I have had a blast with these Manatee Stamps once again!!! They are so versatile!! 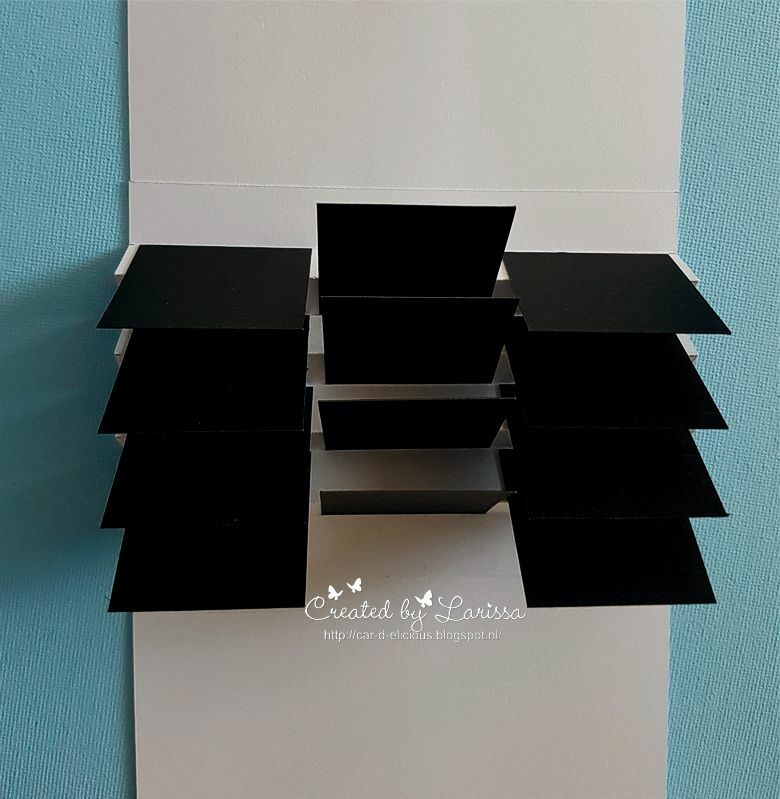 You can use them for all sorts of cards. 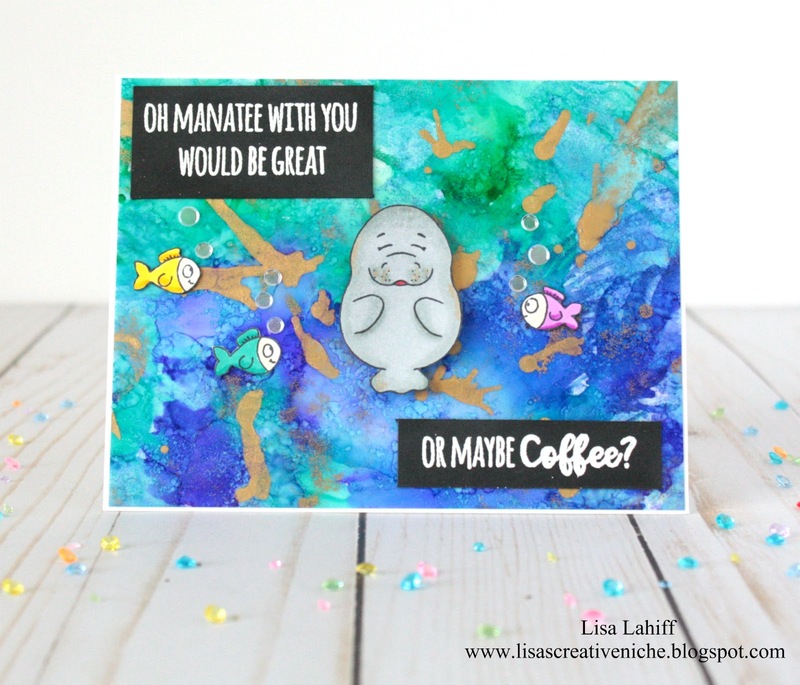 You get 3 Manatees in the set, 2 little fishys, the seaweed, bubbles, a mug and 5 Sentiments!!!! I decided to do a spot of water colouring this time. 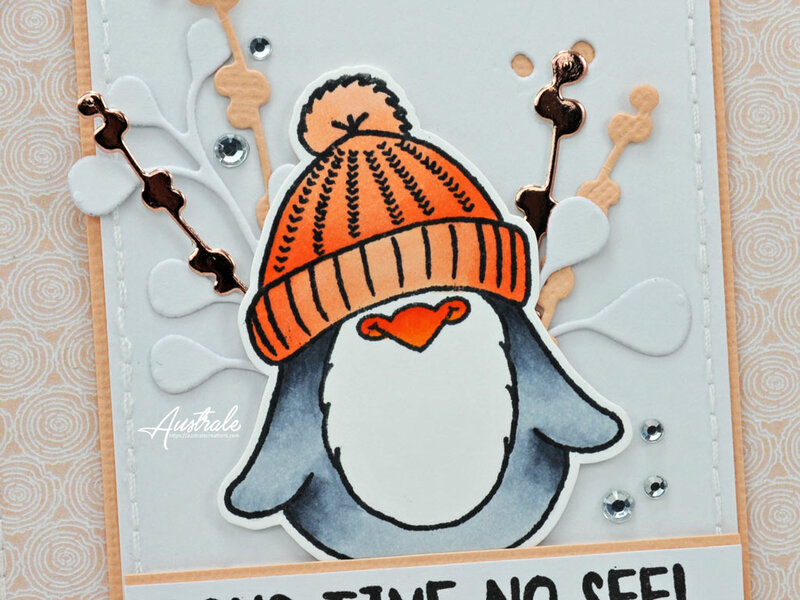 Thought that this wee one would look good in a sea background picture. Hello Gerda Steiner Fans! It is Lisa back today with a cute card that features the newer Oh Manatee Stamp Set and an alcohol ink background. This was my first time playing with alcohol inks, but when I started I automatically thought of the ocean, and new my cute little Manatee would be perfect! To create my card I started with the Alcohol Ink background where I used a mix of dropping, blowing through a straw, and pouncing with a cloth to cover the entire panel. 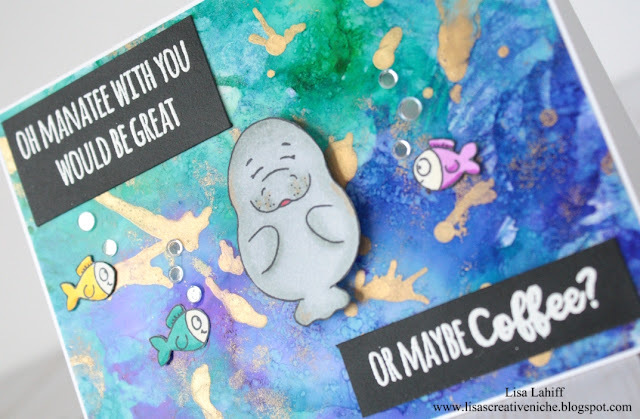 While this was drying I stamped and colored my manatee and fish on separate cardstock. 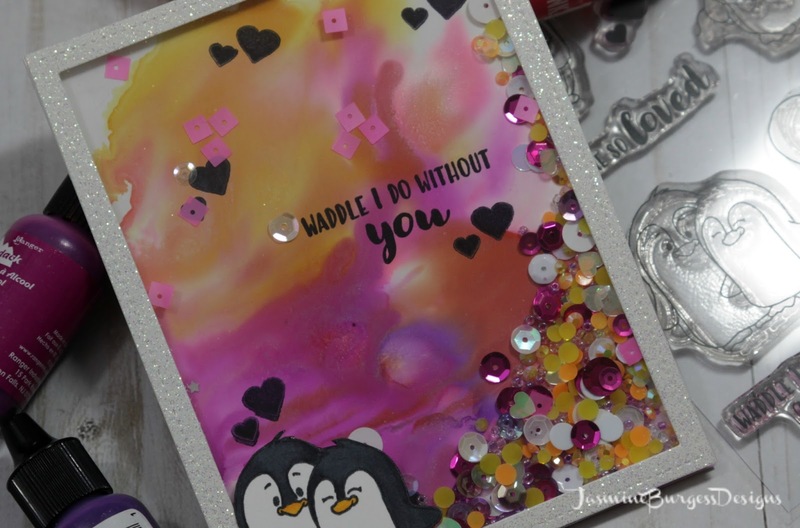 I actually stamped the three different manatees in this set and colored them all in with various Spectrum Noir Markers before I finally landed on the one I liked best. This is a great thing to do with a new set, with so many color options you might not know what you really like until you've tried a few. I then cut all of my images out and adhered them to the alcohol background. 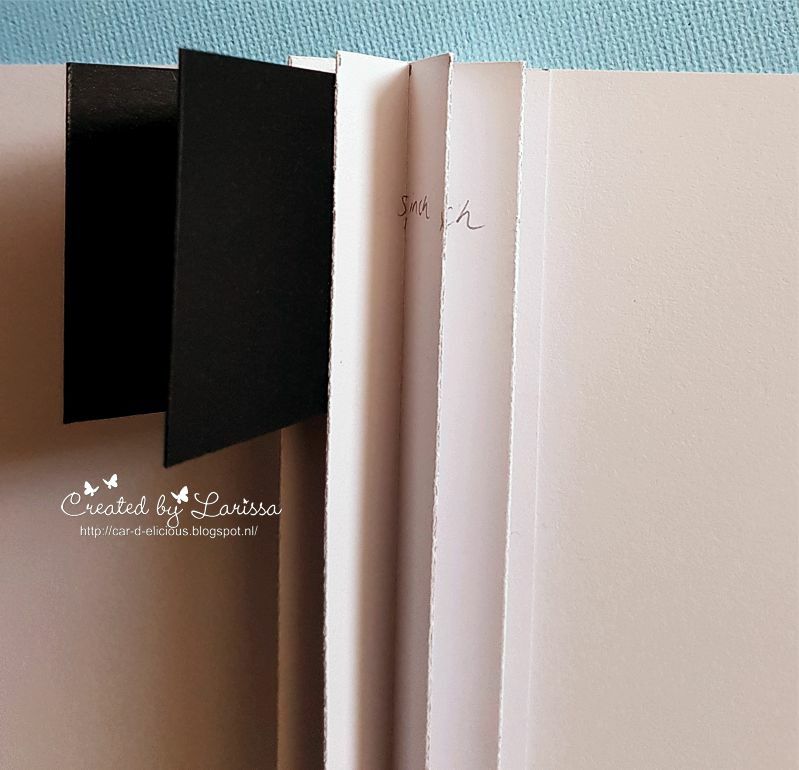 For my sentiment I stamped and embossed them both black cardstock with white embossing powder. Thanks so much for stopping by and checking out my post today! 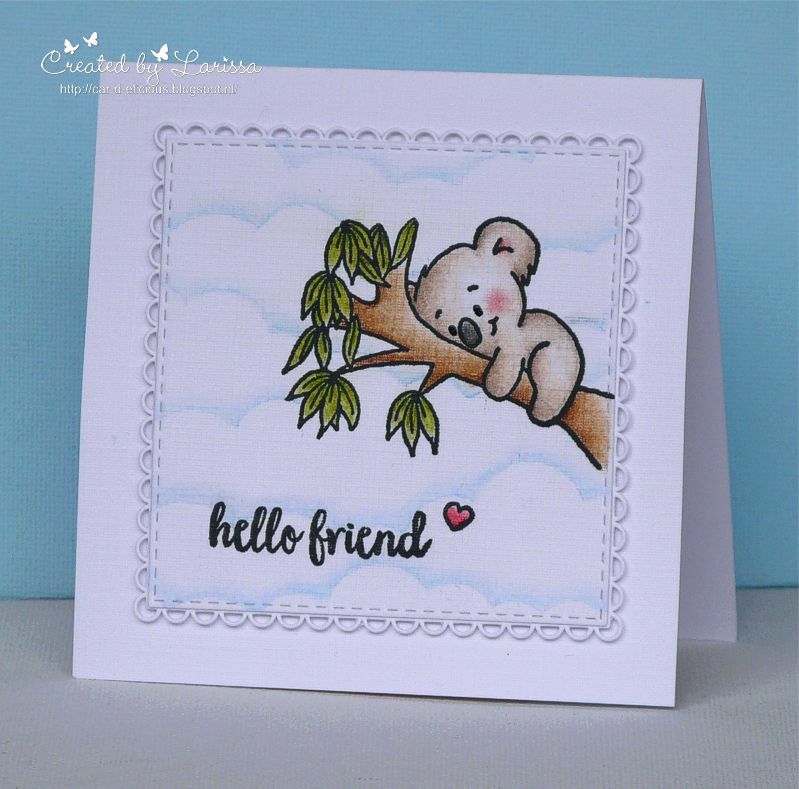 Make sure you head to the store to see what other new stamps are popping up! Hello and Happy 2018! 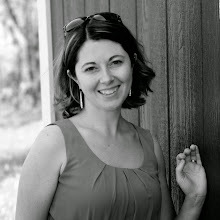 I am so excited to be guest designing here on the Gerda Steiner Designs blog today. 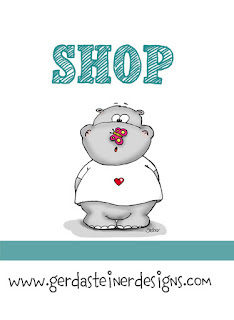 They always have such charming and delightful images with excellent quality products. I was brimming with ideas for these little guys and couldn't wait to play. Valentine Penguins is one of those versatile sets that can be romantic, but also lends itself to friendly or encouraging. 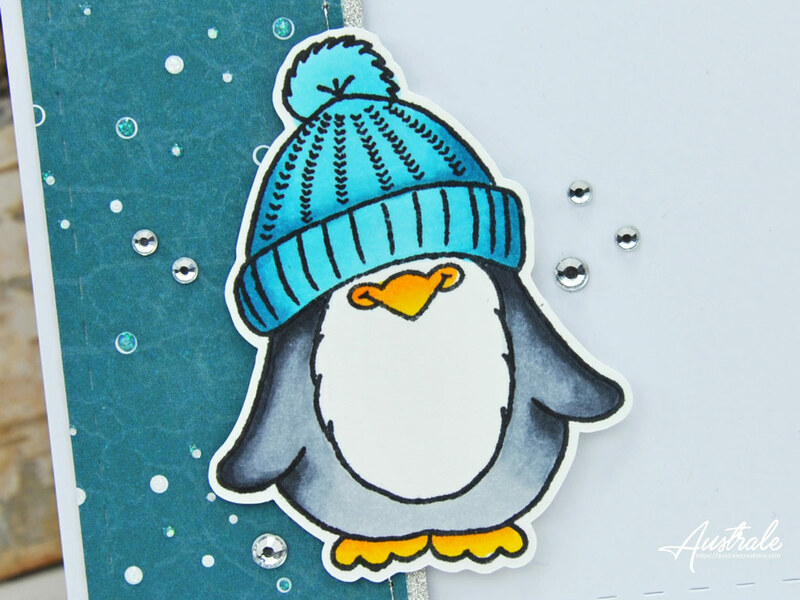 My first card was inspired by Empire Penguins with the really colorful feathers on their heads. I wanted to bring lots of color and excitement to the party and alcohol inks are perfect for that. 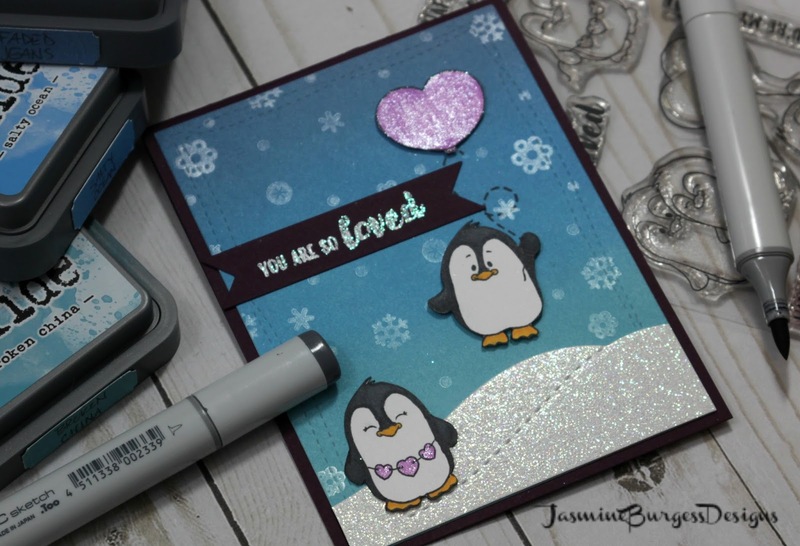 As I worked, the ideas coalesced into a shaker card and I love how it turned out. You can also view the video at my YouTube channel here. Thanks again to Macy and Gerda for having me and thank you for stopping by. As always, I'm happy to help if you have any questions and I'd love to know what you think as well. I hope you have a blessed and joyous 2018. Hi all! 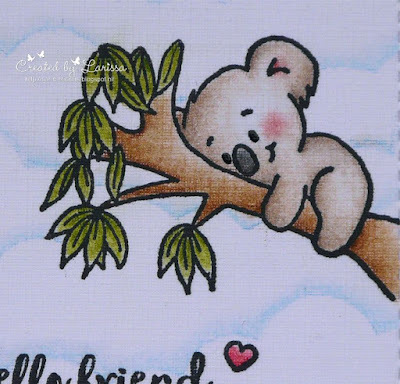 I'm stopping by today to share a fun card with you. To be honest, I wasn't sure what I wanted create at first. I actually stamped all the little manatees and colored them in, not knowing. Eventually, I thought an underwater scene would be perfect for them and I ran with that idea. I knew that I wanted the kelp to be a large part of setting the scene and I wanted to incorporate it with the animals. I thought it would make it super cute where if one of the manatees could peek out. This part was a bit difficult as I had to fussy cut it the kelp but in the end, it was totally worth it. I used watercolor paper since it is thicker and in doing so, I wanted to use my Zig Clean Color Real Brush markers. I actually grabbed all the blues and drew wave-like lines all over the background. Then using a water brush, I just ran it over the lines and blended a little. It literally took me less than a couple of minutes to do this. I think it does give it a very soft ocean look since there are so many different shades of blue. What do you think? 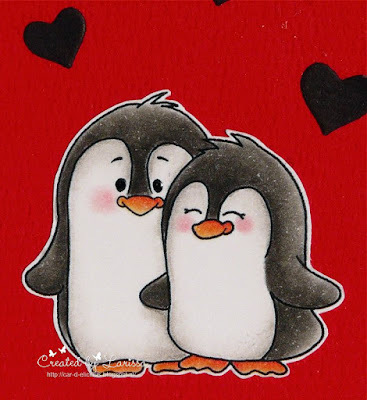 Anyway, I hope you enjoy the card. Hi everyone, I am Larissa from Car-d-elicious and today I am posting a cute card made with the very sweet stampset Valentine penguins from Gerda Steiner designs. I made a harmonica card. 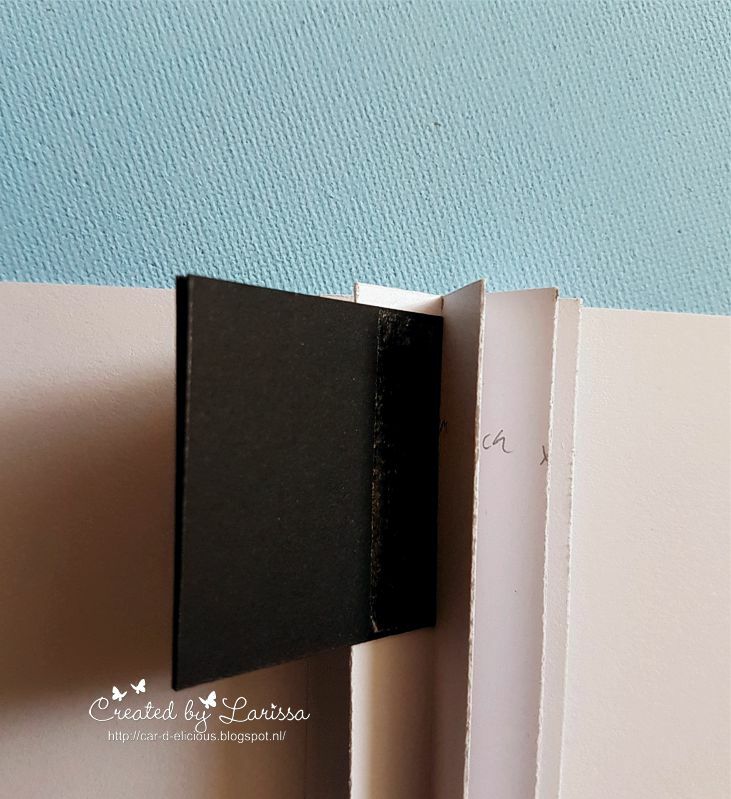 I have a little clip to show you how the cards opens up. I have added a tutorial so you can make this card yourself. Last week I posted a harmonica card for my nephew Niek. 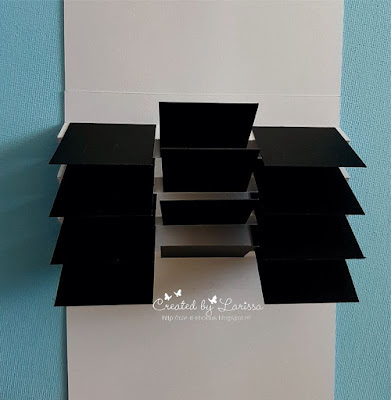 I saw an online workshop from Hobbyvision and this card was so much fun to make, that I had to make another one. 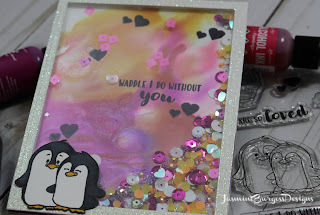 ;) This time the card and tutorial will also be posted on the blog from Gerda Steiner designs. I made the card with the super adorable stampset Valentine penguins from Gerda Steiner designs. I stamped several images from the set and then I coloured them all with my Polychromos pencils and the black glaze pen. 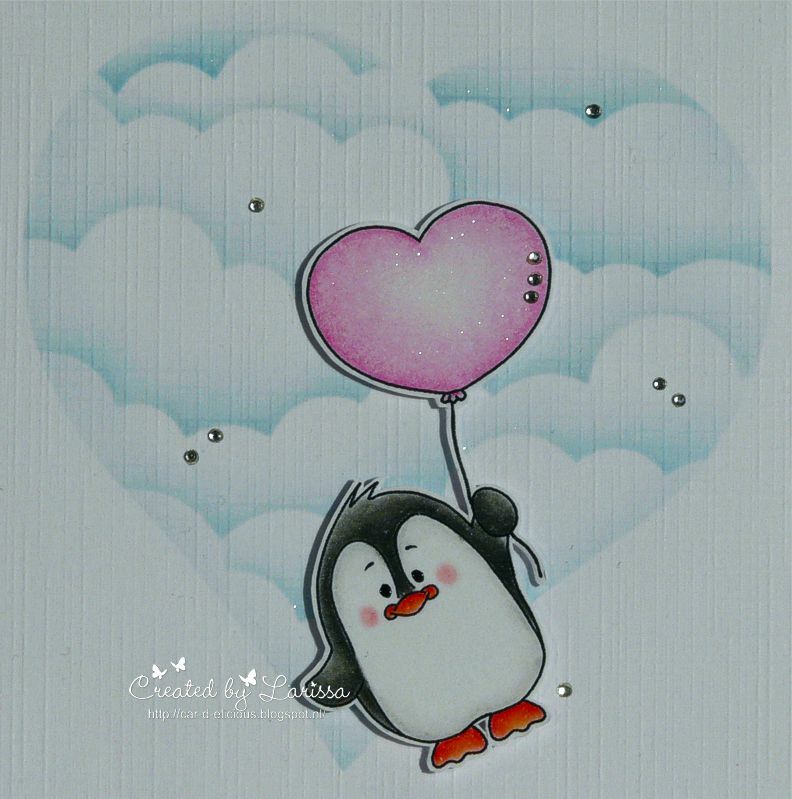 I coloured the balloon with the Clear Spectrum noir sparkle pen. 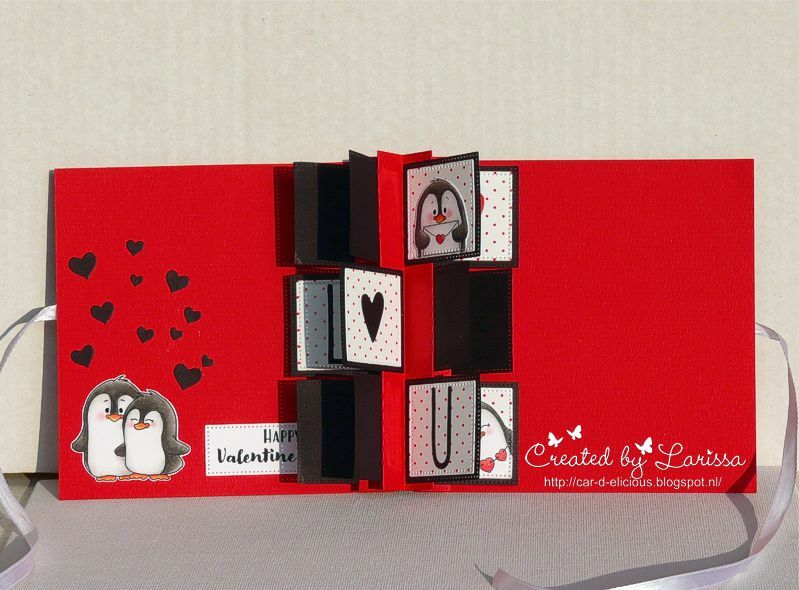 I made the card from red cardstock. 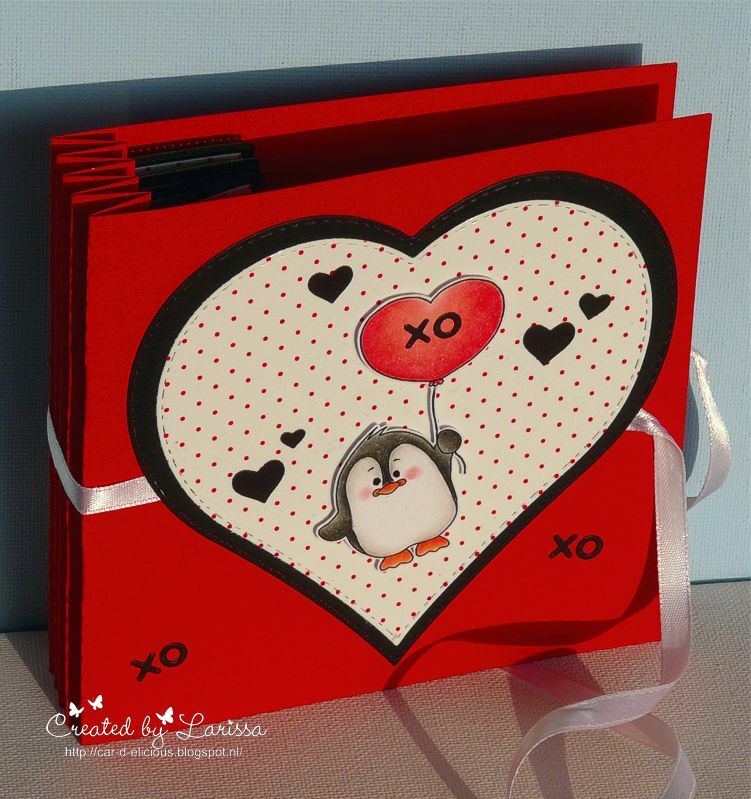 On the front of the card I adhered 2 large hearts. 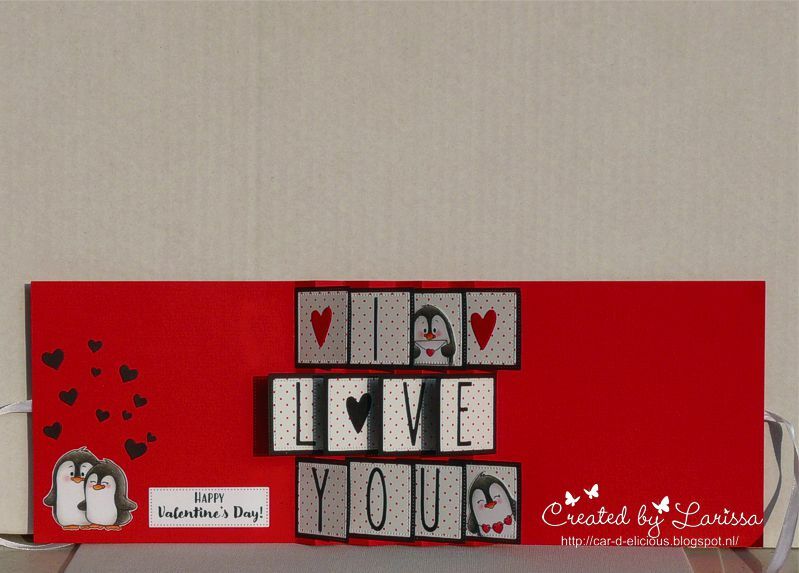 The biggest heart was die-cut from black cardstock and the smaller one from red and white dotted paper. To close the card I used white ribbon. 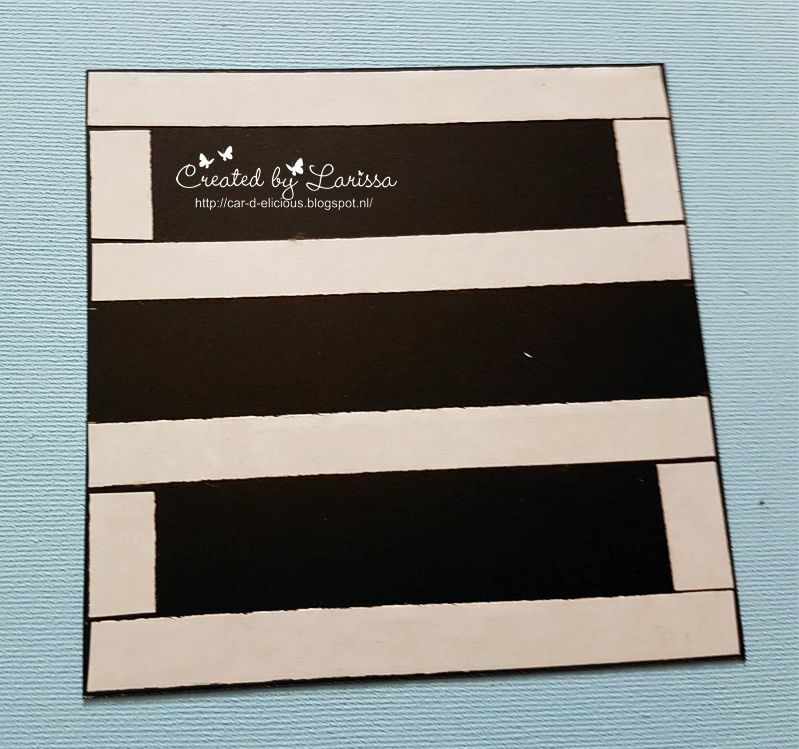 With a little heart die from the Tag builder blueprints 5 from My favorite things I have die-cut a couple of hearts from black cardstock and I adhered those on the card. The little xo's are made with the same dieset. Just like last time I made a card with 4 squares in a row, so you can make 4 letter words. It is really easy to adjust this to more sqaures, so you can use longer words. With the Crea-nest-lies XXL 42 from Crealies I have die-cut 12 squares from red-white dotted paper. I used the Crea-nest-lies XXL 50 from Crealies to die-cut another 12 sqaures from black cardstock and I adhered them on top of each other and glued them in the card. I have die-cut the words I love you from black cardstock with the Journaling alphas dies from Neat and tangled. I replaced the o in the word love with a black heart that I have die-cut with the Gift wrapping: Tags and threads from Marianne design. 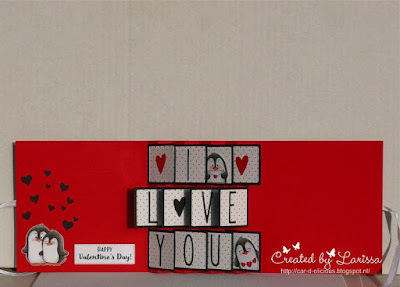 I used the same dies to cut another 2 hearts from red cardstock. 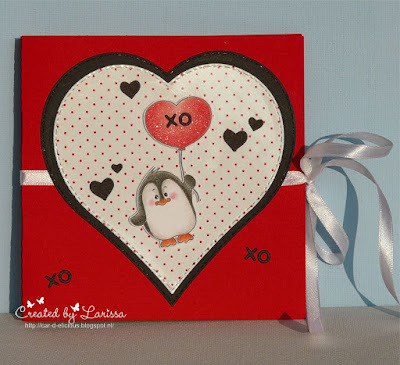 On 2 of the squares I adhered 2 cute penguins from the stampset Valentine penguins from Gerda Steiner designs. 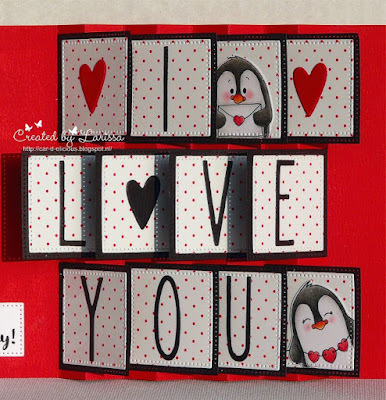 Inside the card I used another image from the stampset Valentine penguins from Gerda Steiner designs. Above the image I adhered a couple of heart that I have die-cut from black cardstock with the Tag builder blueprints 5 from My favorite things. 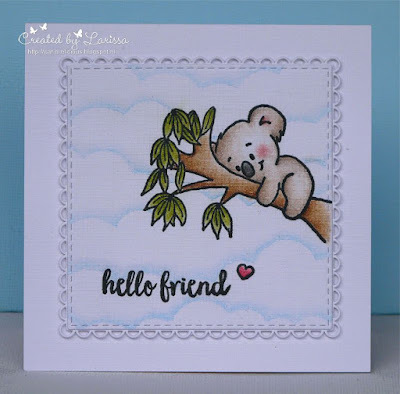 The sentiment is from the same stampset and I have die-cut it with the Crea-nest-lies XXL 52 from Crealies. And this is the turorial for this card. My tutorial is for a card with 4 squares in a row, but you can adjust it very easy to more sqaures if you want to use longer words. 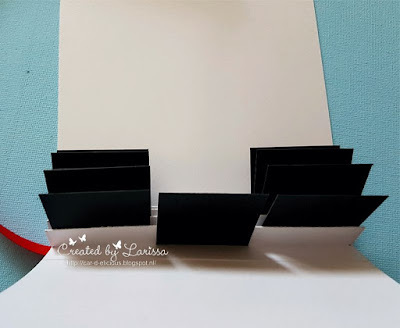 Start with cutting 3 pieces of cardstock. 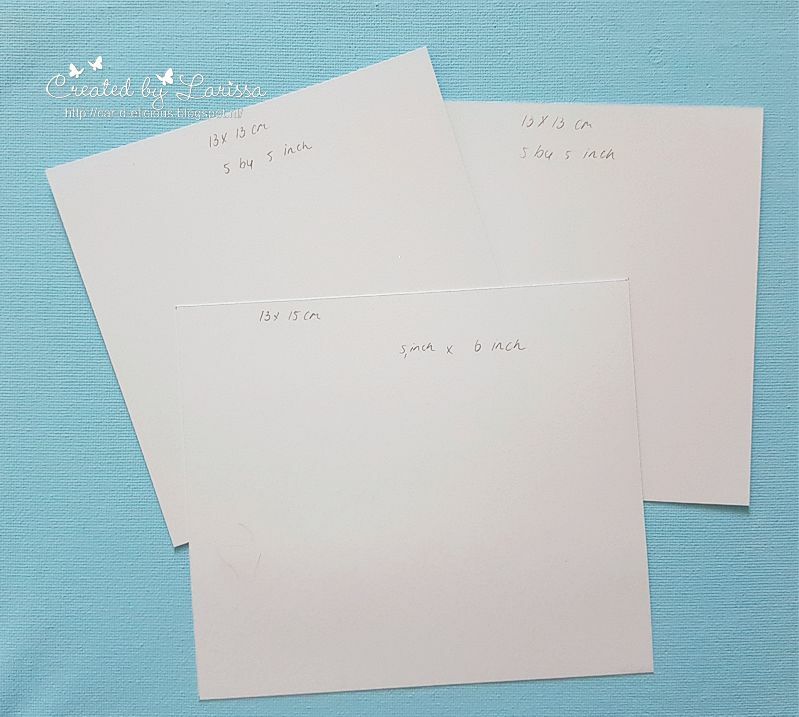 The sizes are 13 x 13 cm or 5 by 5 inch (cu 2 of this size) and cut one piece from 13 x 15 cm or 5 by 6 inch. 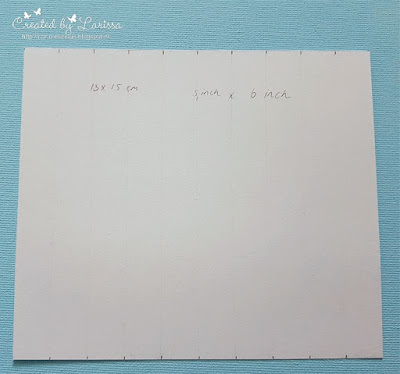 If you want more squares in a row, make that last piece longer with 3 cm or 1 inch for every square you want to add. So if you want to have for example 6 squares in a row, you cut the paper 13 bij 21 cm or 5 by 8 inch. 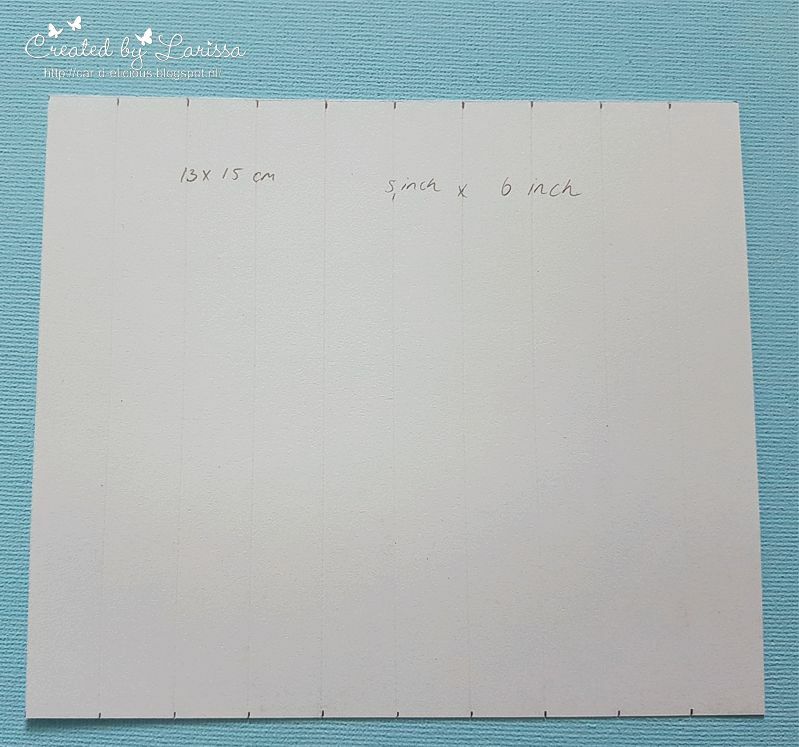 Make scoring lines every 1,5 cm or every 0,5 inch. Adhere glue on the first en last strip and glue the front and back of the card on the harmonica part. 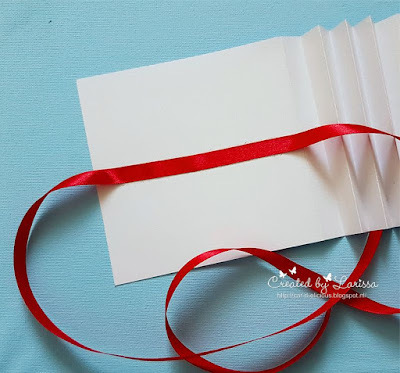 Take a long piece of ribbon and glue it onto the back of the card. DON'T glue it on the front of the card!!! 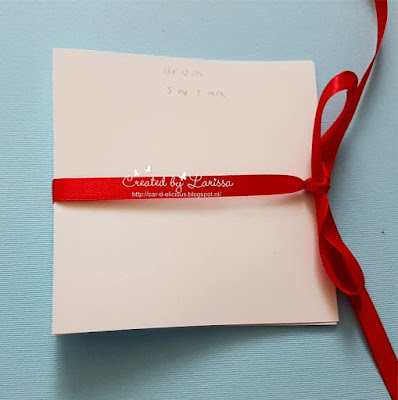 Make sure the front of the card is facing you and tie the ribbon into a bow, to make the decorating of the front of the card easier. Put double sided tape on the square you are going to use to decorate the front of the card. 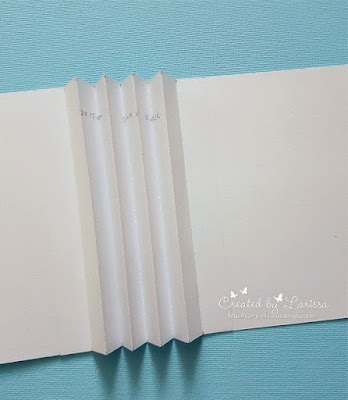 Make sure there is no glue where the ribbon is on the front of the card. 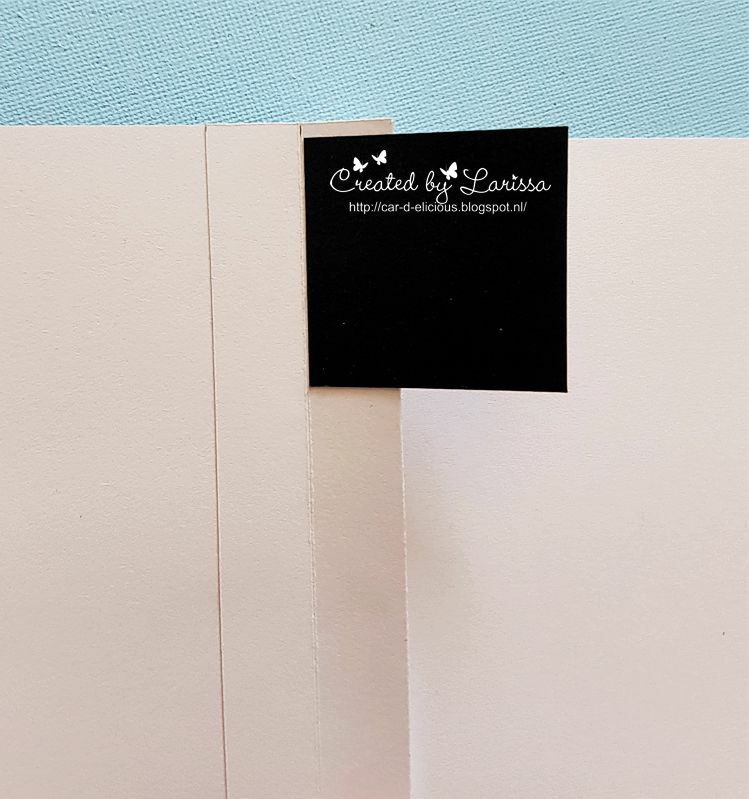 We don't want the ribbon glued on the front of the card. 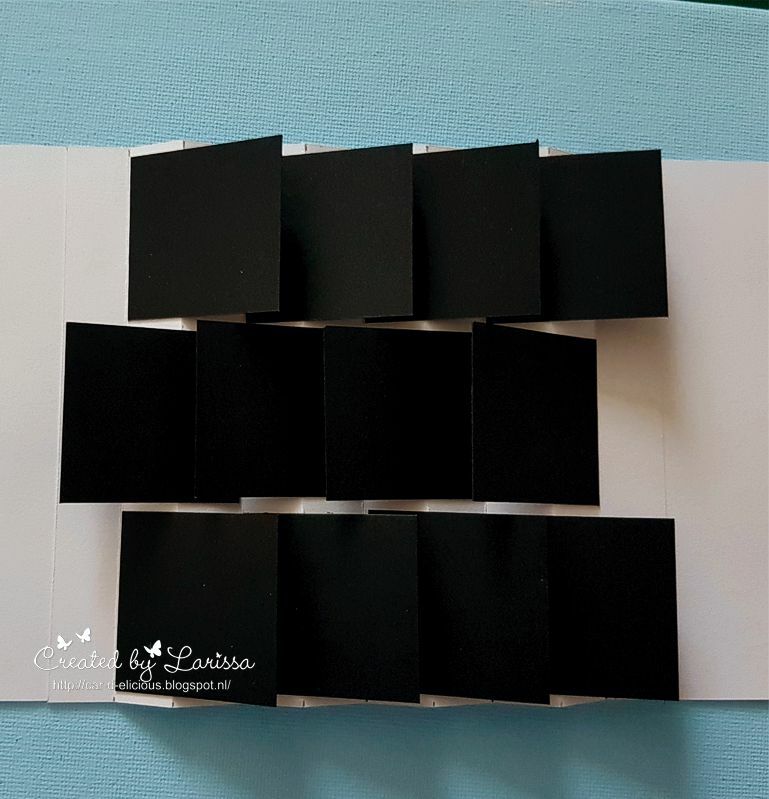 Cut 12 squares from cardstock with the size of 4 by 4 cm or 1,5 inch by 1,5 inch. 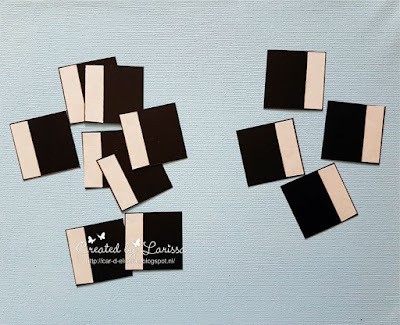 Put doublesided tape on the edge of each square. Keep 4 squares seperate from the other ones. Start adhering the first square on the first fold. Leave a little room, don't glue it on the edge of the card. To make sure all the squares are glued in the same place in the card, make sure you place the second square exactly on top of the first square. Then push the second fold against the second square and they will be both in the same place. You can attach the thirth and fourth square the same way. Adhere the 5th square just like the first square. 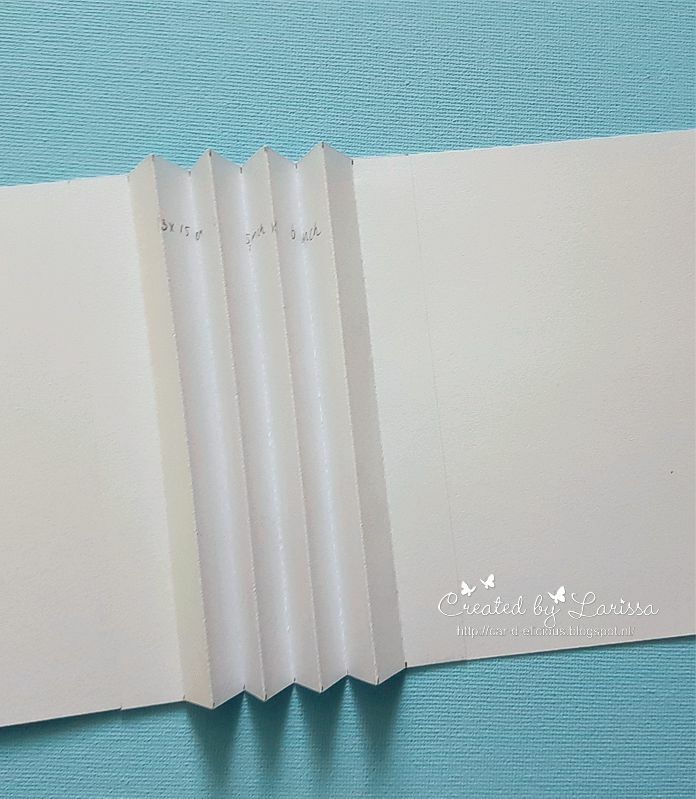 Don't glue at the bottom edge but leave a little space between the bottom and the square. Then adhered the other 3 squares. 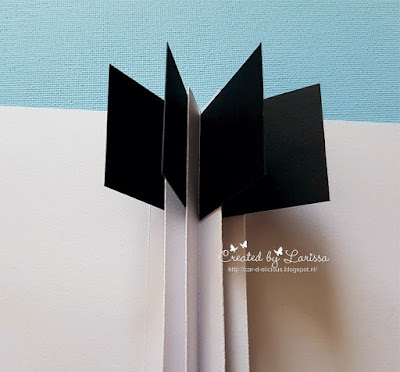 Turn the card around and adhere the middle sqaures on the other side of each fold. Make sure the space between all the squares is even. This is how it looks when all the sqaures are adhered on the card. The 4 in the middle go in the opposite direction of the squares on the top and bottom. 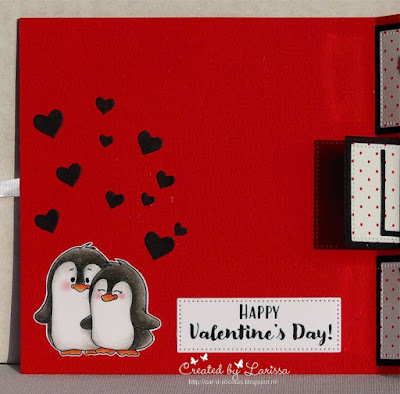 If you carefully pull on the left side of the card, it will lay down all flat and then you can easily decorate all the squares.